Thank you so much for drawing attention to this. I've only had MS for 5+ years but have been on antidepressants and struggling with depression for 23 years. I had not heard the story of this particular antidepressant in England. We don't have it in the US (I guess the FDA decided it didn't meet their standards) but I have read similar stories about American prescribed antidepressants -- this has been a problem for years. Most of the ADs are statistically said to be almost no better than placebo in a clinical setting if you take into account all of the studies (which some people have discovered through use of the Freedom of Information Act). It really is frightening that pharmaceutical companies wield that much power in our world, isn't it? And what can we do if our own doctors don't have access to legitimate information? And imagine, as you said, what it's like with MS drugs (or any other autoimmune drugs for that matter). The MS treatment market alone is about $10 billion right now. Analysts expect it to grow to about 14 billion in 2015. Love your blog and always find it highly informative. Low Vitamin D3 can cause depression. Most people with MS have low Vit. D.
You are correct, it is very important for MS patients to monitor their vitamin D levels. Marc, thanks for keeping your critical light shining on Big Pharma. It may take a long time, but I think change will eventually come as long as we keep the issue on the front burner. Hey, it's a dirty job but someone has to do it. Actually, I can't say I am all that confident that things will change as long as Big Pharma keeps on earning its billions. We are cutting government budgets, and leaving more to the private sector. In some areas this may be prudent, but medical research cannot be driven by the profit motive, there are just too many conflicts of interest. Marc we've never met but you have no idea how much I appreciate your existence. Not to mention the power of science and it's undeniable truth. Thank you Marc for keeping Big Pharma's feet to the fire. You are doing a great service for everyone. It is sad indeed when we must be our own doctor. No surprise, then, that I usually find news about drugs in development on the business page. Treating sick people as a profit center is just so wrong. Nice work, Marc. I would add another note to your points. Since I have been diagnosed with MS I have had wonderfully well-informed, conscientious, and compassionate doctors, but once upon a time many of the symptoms I now know to be the result of MS were attributed to mental illness--specifically, depression and PTSD. 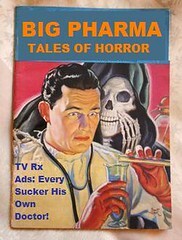 One psychiatrist I saw during that time period prescribed "Big Pharma" meds like they were Tic Tacs. At one point, I had an entire cabinet shelf full of different types of antidepressants that the psychiatrist insisted I "try." Now that I know that many of the symptoms I was having are MS-related--problems walking when I was stressed, depression itself, muscle spasms that came and went unpredictably, etc.--and not mental illness, I am appalled by what seems to me to be that psychiatrist's problematic reliance on Big Pharma's products. That New York Times piece was amazing. Incredible how many doctors are simply prescription machines, especially psychiatrists. Thank you for your voice in the wilderness. May it help us emerge someday to see the unencumbered light of day. Have you heard of LDN and the book "Up a Creek with a Paddle" as well as Honest Medicine? I still marvel at the fact that most MS research is done on mice who do not get MS at all. Instead, the symptoms are induced in the mice who then are treated with the meds that become the blockbusters for Big Pharm. It appears that the treatments don't seem to work on people as well as the mice. Or, am I being too cynical?Oh yes, I forgot, the mice also die sooner. Also, since MS is reputed to be "different" for each person, how then can these trials have any validity when the so called "control" group is so markedly diverse? Bottom line once again is not finding cures, helping the suffering person have quality of life, or even pretending to be honest in the data......it is SHOW ME THE MONEY BABY!!!! The problem is that nobody is really searching for the root cause of MS, and all the drugs they are coming up with are really just sophisticated symptom managers. An out of whack immune system is a symptom of something deeper going on, but all of the MS drugs either modulate or suppress the immune system. Ben Goldacre is an enthusiastic showman and columnist and has done a great job at highlighting the priorities of big pharma. Ultimately though, they're just companies primarily in the business of making money, making patients' lives better would seem to feature further down the priority list than shareholder's profits. How can we separate money from healthcare? So, even if we can't take money out of the process of patching people up at least we can be better aware of what's being done 'for our own good'. Thanks very much for the link,I will definitely check it out. You are very right that the pharmaceutical companies are only doing their job, making money for their shareholders. That's the problem, the flaws are built into the system, they are insidious and pervasive. Which means that there are no easy solutions. I'd add one more to your list of ways Big Pharmaceuticals can skew data, seasonality of symptoms. I have been trying for a few months to get Patientslikeme.com to give me access to their records of patient reported new symptoms. I saw a study last year which looked at 2 different (small) groups of MS patients. It looked at them on different days and published the results saying the patients on the hotter day had more cognitive impairment. Every MS patient and researcher I've shared the stufy with has the same response, "Duh! They spent money/time to come to that conclusion?" The thing is this seasonal adjustment should be a part of every MS study, and probaly other conditions as well. I tried to get access to the data, because I already have seasonal adjustment measures programs for other studies at my work. I want to look at all of the MS drugs and categories of symptoms to see how seasonal the results are and can be. If I were a pharmaceutical company and got to pick, I would schedule my MS drug trials to begin in July and end 18 months later, in the winter. Then I could claim any improvement as the result of my drug, and a stable result as a good one even if it masked the worsening condition at the 12 month mark. In any event, thank you for your post. This information should be widely available. I'm just thankful the fed does now require and post a listing of all proposed studies and their results. The drug companies can and do take advantage of things like the seasonal cycles of MS. There are just so many ways to "cook" the numbers, and yet these companies still bury the results of negative study outcomes. Some of the research done to improve health is not always celebrated. Here is some good research I found. IL6 antibody has a wide range of biological effects, and is an important function in the immune system and acts as both a pro-inflammatory and anti-inflammatory cytokine responses. IL6 antibody is pertinent to curing many diseases such as diabetes, depression, prostate cancer, Alzheimer's Disease, systemic lupus erythematosus etc. Thank you for the article anyway, its helped me with my research.